However careful you are with your diet, it’s almost impossible to avoid the toxins that pervade our environment from everyday items like carpets, plastics and cleaning agents. Then there are the toxins you create in your body through stress and holding on to thought patterns and emotions. It’s no wonder we all need to detox! How about a simple way to detox that you can use everyday? Like brushing your teeth, except easier! And, like brushing your teeth, an everyday detox helps prevent unpleasant health problems. Place your thumb pad on the inside base of your ring finger. 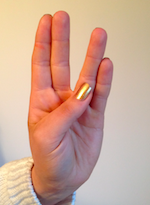 It’s preferable to do this mudra on both hands together, though you can alternate hands if need be. Hold for 3 – 5 minutes. Later you can build up towards 45 minutes if you like, and this can be a series of shorter sessions during the day. For me, toxins show up in my skin, and I find this mudra very effective at clearing those blemishes. And of course it makes sense to take practical steps to minimise your uptake of toxins in the first place! Dealing With Illness What Would Your Future Self Say?